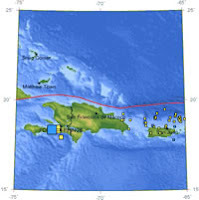 As many know already, there was a Magnitude 6.1 earthquake in Haiti early this morning. The ESRI GEOSS/GEO Viever and perhaps others can help you visualize this. For those who might want to learn more about this earthquake and quakes in general, the USGS Earthquake Hazards programme provides lots of current information and of interest to GIS-ers, the data are also available for download or via webfeeds.